Best Burger: What's The Side To Go With It? We’ve said it before and we’ll say it again: nothing goes better with gourmet burgers than french fries. Sometime long ago someone found out that burgers and fries was the best combination out there, and we’re certainly glad they did! That doesn’t mean that the evolution of the french fry has to stop, though, and we want to make sure you get the fry you want when you come to Barney’s. So when you’re ordering up the best burger around, which fry are you going to choose? So you like a larger fry that retains that potato taste more than any other? You’ll love our steak cut fries at our burger shop. Need an even stronger taste? Try yours with fresh minced roasted garlic. Our most traditional fries, really crispy, and really tasty. Our roasted garlic is a great addition to these as well. Our spicy curly fries might be the most popular here in our burger restaurant. Not many places offer curly fries, and even fewer cook them right. The fact that people order them so often is a testament to our cooking method. We serve these with ranch dressing and the flavor combination is very tasty. Not everyone is a fan of sweet potato fries; maybe they’re just a little too far away from a traditional french fry. But for those who enjoy them, it can be hard to go back! Enjoy ours with chipotle aioli. Some people stop by our burger bar just to snack on these! Our truffle fries are tossed in truffle oil, sea salt, parmesan cheese, and parsley. If you like the taste of truffle, you’re going to love our truffle fries! When you want to go all out with a taste explosion, you’ve got to try these. We take our skinny fries and top them with our freshly-made beef and bean chili, then add top-quality cheddar cheese. 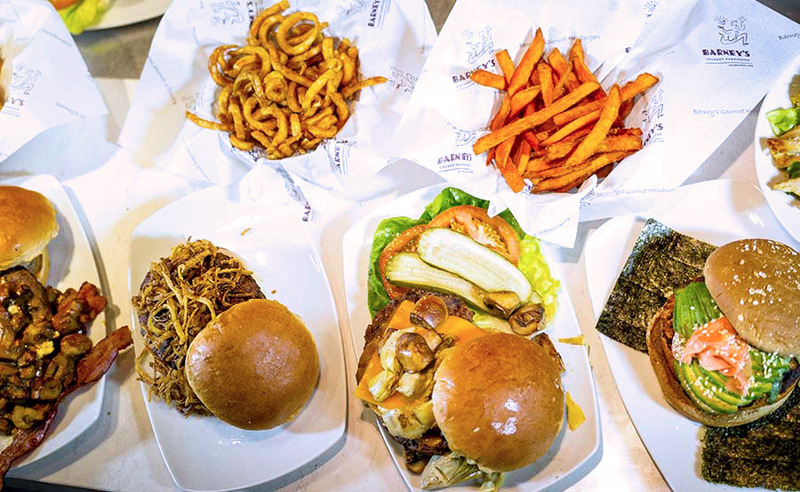 At Barneys, we only offer the best fries because we know that the quality of the fries has to be at least as good as your gourmet burger so that the meal is complete! We’ll see you soon!